To Bail (v.): To sacrifice the joy of riding ripio with the wind in your face in the middle of nowhere for days on end in favor of riding a bus for hours on end. You have reached this page because Mark & Mandy decided to bail out on this leg of the bike ride in favor of more fun later. "An old Indian legend tells us the story of a prince that was fleeing west, pursued by the Spanish conqueror. Once captured by these ruthless white men that wanted his gold he was murdered. Before his death he called upon his god, and god sent him his messenger, the wind, to take him away. But the wind was not able to find him and since then its search continues endlessly in every corner of Patagonia, because that was its owners wish." So we have tried in vain to dissuade the messenger, shouting "We're not Spanish! ", and "He's over there, not here! ", but to no avail- so it's time to bail! Well, I was going to leave it at that, but the bus ride was literally a trip and so I'll describe it in a bit more detail. 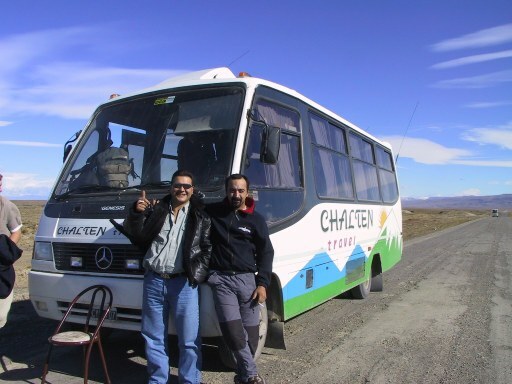 It all started in El Chaltén with a mountain of luggage, two bikes and 22 pasajeros (passengers) staring dubiously at a mercedes microbus. Our drivers Alejandro and Dario are two laid back guys in their 30s. Believe me, type A personalities need not apply for the job of driving a bus down La Quarenta (route 40- "The Q"). Dario looks at the luggage, looks at Alejandro, and with a chuckle says "Suerte!" (good luck) and starts walking down the road. Alejandro gives us an exasperated look and calls Dario back. So bikes, backpacks and other miscellaneous luggage get piled into the cargo area, the pasajeros pile into their seats, and then more backpacks are stuffed into the aisle and wedged into the stairwell next to the door. Dario borrows a chair from the hostel to sit on, while Alejandro takes the first turn at the wheel, and the 15 hour trip begins. ¡Vamos! About an hour out of El Chaltén we stop at a crossroads, and Dario announces "Gente- esparamos aqui para otro Micro" (We are waiting here for another bus). "¿Porque?" (why?) queries a curious pasajero. "Porque tenemos tres mas pasajeros" (we have three more passengers to pick up), Dario says with a grin. At this point I look around and notice that there are indeed three empty seats. Soon another bus arrives, and three more folks squeeze in, and more backpacks fill the aisle. We drive another half hour through the pampas and reach a forlorn gas station. While filling up, I notice that Dario is having a lively discussion with an Israeli couple who had left our hostel three days before. After a while Dario smiles at them and waves them aboard. 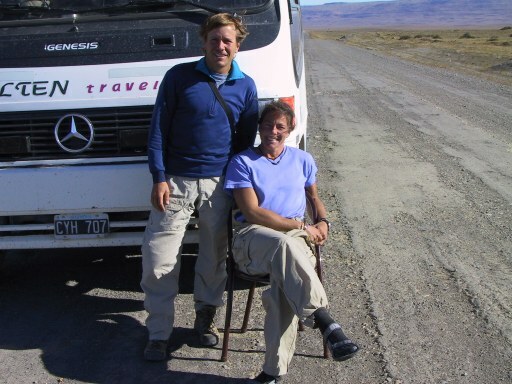 They had been trying to hitch a ride up ruta 40 for three days with no success, and were stranded at the gas station. So they pile themselves and their packs into the overflowing aisle and we are off again. ¡Vamos! Three hours later we stop at the aptly named Estancia Siberia for an hour lunch break, and we all pile out, walking on the arm rests to get down the aisle. 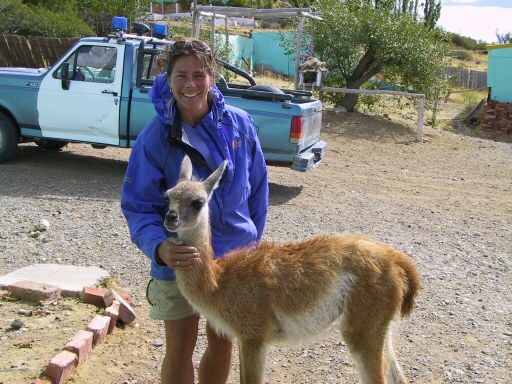 After lunch a young and obviously domesticated Guanuco wanders up to us, and we take photos with it and then pile back into the bus. As Dario is getting in, the guanuco looks wistfully at him and Dario says "¡No, el bus es completo!" (the bus is full), and the guanuco dejectedly wanders back into the estancia. ¡Vamos! Some time later we are cruising down the ripio at 40km/hr when we hear the characteristic Thwock, Thwock, Thwock of a flat tire in the rear. All of us pasajeros are expecting Alejandro to stop and fix it, but he doesn't even let up on the accelerator. "Stop, we have a flat!" exclaims an excited pasajero. "Si." says Alejandro, "The noise will stop in a bit- turn up the music, would you Dario?" Apparently not all four tires on the rear axel are necessary! ¡Vamos! Throughout the trip Alejandro and Dario play a variety of music for our enjoyment: Argentine artists, Stevie Ray Vaughn, Santana, and of course, Led Zepplin. Dario also passes around pictures that he has taken on prior trips: beautiful sunsets, various animals running away from the bus, and several shots of tourists pushing the bus out of sundry mud holes. A while later we arrive at a tiny dust bowl hamlet in the middle of nowhere (actually, everywhere is the middle of nowhere on ruta 40), and Dario announces with panache "¡Bienvenidos a Bajo Caracoles!" (Welcome to Bajo Caracoles) So we all pile out and invade a tienda where the owner has been anxiously awaiting our arrival. Soon it is time to go again, and we step outside to witness one of the most beautiful sunsets I have ever seen. 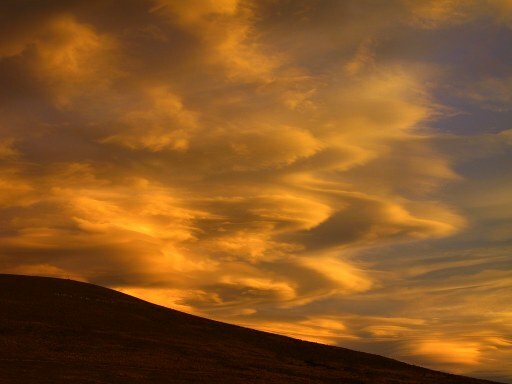 Even the clouds in Patagonia are sculpted by the wind, and everywhere disks and swirls of water vapor were lit yellow, orange and red in the evening light. After a brief stop outside of town for photos we set off into the Patagonian night, leaving behind a trail of tire pieces... ¡Vamos!